The New York City Department of Buildings ("the Department/DOB") is in receipt of your undated letter (received by DOB on August 9, 2011) that treats the Department's failure to provide documents responsive to a June 14, 2011 FOIL request as a constructive denial. On June 20,2011, the Department informed you that it was in receipt of your FOIL request and was working to determine if it had any of the requested documents. You are treating this determination as a constructive denial based on the fact that the Department did not provide an update within the 30 days as stated, and that the Department is still working on your request. 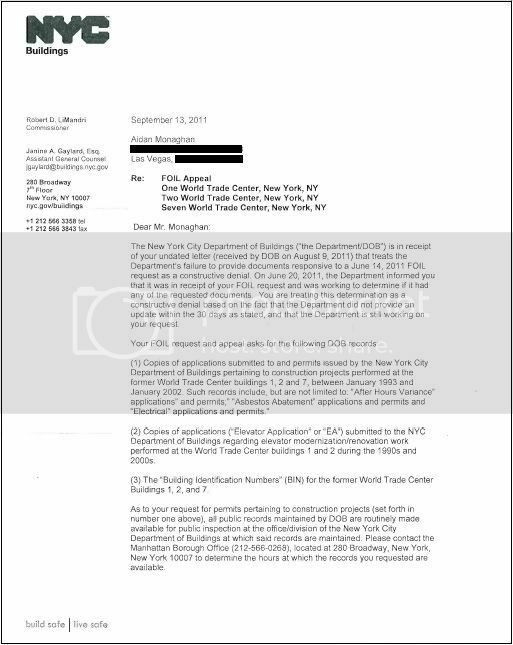 (1) Copies of applications submitted to and permits issued by the New York City Department of Buildings pertaining to construction projects performed at the former World Trade Center buildings 1,2 and 7, between January 1993 and January 2002. Such records include, but are not limited to: "After Hours Variance" applications" and permits;" "Asbestos Abatement" applications and permits and "Electrical" applications and permits." I am told that Asbestos Abatement" applications are filed with the New York City Department of Environmental Protection (CDEP"), so the Department would not have any responsive records. Please direct your request for these records to DEP. properly a FOIL request, since FOIL applies only to existing records. 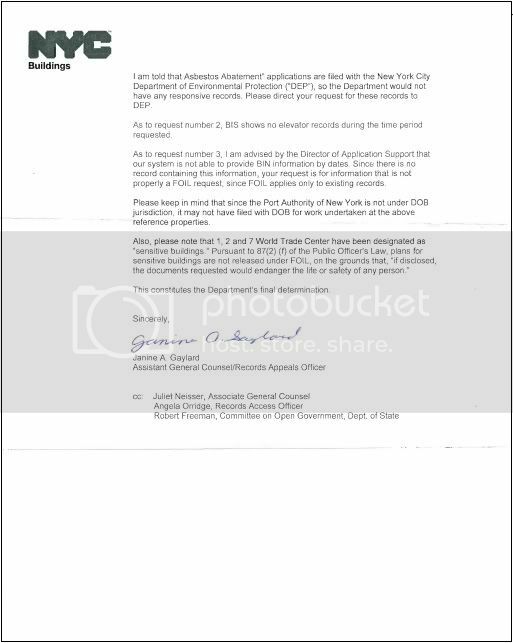 Please keep in mind that since the Port Authority of New York is not under DOB jurisdiction , it may not have filed with DOB for work undertaken at the above reference properties. So not disclosing protects us from better construction? As usual, thank you for your tireless work Aidan. It boggles the mind how it makes us safer to not disclose information that could add to our understanding of building construction safety. How are they "sensitive buildings" when they no longer exist? Obstruction of the truth or concealment of information to protect us? As Paul Craig Roberts said about the recent assassination of an American, America has died--at least Constitutionally and idealistically. cyberfossil on Tue, 10/04/2011 - 2:18pm. Also, please note that 1, 2 and 7 World Trade Center have been designated as "sensitive buildings" Pursuant to 87(2) (f) of the Public Officer's Law, plans for sensitive buildings are not released under FOIL, on the grounds that, "if disclosed, the documents requested would endanger the life or safety of any person"; specifically those involved in the continuing Government and media cover-up, as well as persons still living that were involved in the planning and execution of the entire 9/11 event. Jon Cole on Tue, 10/04/2011 - 3:28pm. How can the release of paper or electronic records endanger the life or safety of any person? 1. Under this rule, the dangerous portions could be redacted and the rest of the records released. 2. Note that the rule says "could" endanger, while the response says "would". 3. Is the "person" they cite a flesh and blood human or a fictitious corporation? If the latter, then I can see the logic behind the denial. 4. How can a non-existent building be deemed sensitive? 5. How can a non-existent building drawing endanger anything, let alone life or safety? The agency cannot make such a statement without a detailed explanation citing exactly how. Please send these comments back and chastise them for wasting your valuable time. And thank you for your continuing efforts. kawika on Tue, 10/04/2011 - 7:19pm. No elevator modernization records (one of the largest ever), no records describing the methods and materials used during the extensive elevator shaft steel column work recommended within the 12/2000 Meritt/Harris WTC property assessment. The two agencies who should have records that would describe what was taking place within WTC 1 and 2 leading up to 9/11 were destroyed and not shared with other agencies. Such records could have yielded clues as to how covert demolition preparations may have been made. The only apparent way to learn what was going on inside the WTC towers just before 9/11, is to locate and depose the project managers and engineers of the Port Authority and Turner Construction who were there. Aidan Monaghan on Wed, 10/05/2011 - 3:29am. have a series of unfortunate accidents. Jon Cole on Wed, 10/05/2011 - 6:22am. It wouldn't take much to find these people. A private investigator or even a journalist. Perhaps a Chip-In fund could be started to collect funds for the services of those who are experts at locating others. Wonder how many (if any) of these types of project managers/engineers were lost on 9/11? Aidan Monaghan on Wed, 10/05/2011 - 4:50pm. Peter Rinaldi. I'm still waiting for records produced by him AFTER 9/11. No excuse. They couldn't have been destroyed in the collapse. kawika on Wed, 10/05/2011 - 6:47pm. Try to imagine being the person that drafted and put this release out. I couldn't do it. Who are these people? Do they really expect that a statement like this is going to satisfy skeptics, or convince anyone sitting on the fence that this is anywhere near reasonable? So outrageous is this statement that it would push someone that was not leery of the governments version into the camp of those that suspect we've been lied too. They have no conscience, no soul, no humanity, and soon we can hope they will have no freedom nor life. MrM on Wed, 10/05/2011 - 9:50am. "As to request number 3, I am advised by the Director of Application Support that our system is not able to provide BIN information by dates. Since there is no record containing this information, your request is for information that is not properly a FOIL request, since FOIL applies only to existing records." Aidan Monaghan on Wed, 10/05/2011 - 4:57pm. InfoWars.com is running this story, along with previous entries. TomT on Thu, 10/06/2011 - 9:17am. court of appeals, to appeal the decision made by the judge not to allow access to files the FBI has in its possession. a cover up surrounding the events of 911. Paul Stockdale on Sat, 10/08/2011 - 3:20am.